By default, FME keeps any connections to Oracle databases open for a period of time following a completed translation. This behavior ensures the connection remains open for other requestors, which may be useful for long-running translations, and translations that are run repeatedly from FME Server. However, you may wish to close the connection as soon as it is no longer needed by the workspace, freeing it up for other business processes. 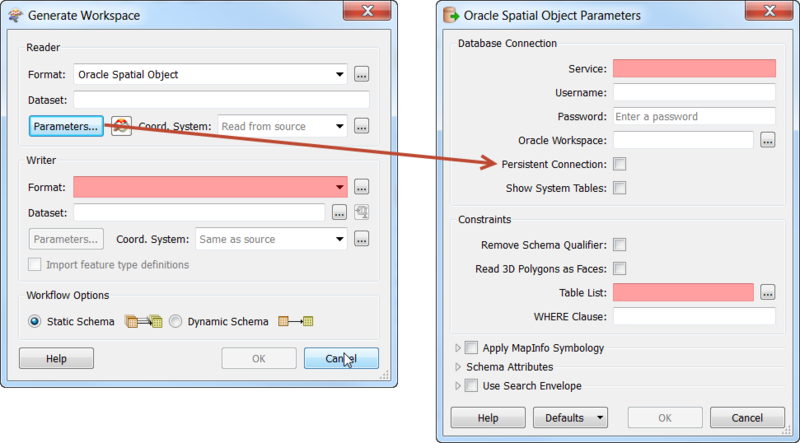 When creating a new workspace using an Oracle reader or writer, and you do not want the connection to the database to persist after the translation completes, clear the Persistent Connection parameter. When this parameter is cleared, the connection to the Oracle database is closed as soon as data processing is complete and the connection is no longer needed by the translation. You can also find this parameter in the Workbench Navigator window of existing workspaces created in FME Desktop 2013 or later, under the reader or writer parameters. Edit the value, then save the workspace.